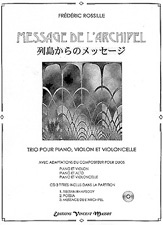 Packaged with the book "Emotion et musique"
Music for piano and percussions dedicated to Jean-Jacques Werner. Commissionned for the Panorama-Oeuvres contemporaines collection, edited by Daniel-Lesur and Jean-Jacques Werner. The percussion section consists of a Tibetan bell, a suspended cymbal, four toms, a bass drum and a snare drum. Duration : 2mn 40s. The original score for piano and percussions was published by Gerard Billaudot publishing (book 'Batterie 2' - 1997) and at present by La Vie des Notes publishing. A piece for piano solo commissionned for the fortieth anniversary of the international architecture review Le Carre Bleu. Timing : 3mn 27s. Audio file. The facsimile of the score is published in the issue 1/99 of the review. Quelles musiques pour demain ? Upon the initiative of Jerome Schmidt (with our acknowledgements) and with the nice permission of the review Phreatique, this article is published in two parts in the numbers 12 and 13 of the webzine Art Zero.